The objectives and the results of my limited test are discussed below. The results were a bit surprising. and variables inherited as members of a prototype object (e.g. the prototype of a constructor function). (Remember: the protoype object of a constructor function is linked to the __proto__ property of the objects created with the help of the constructor). Actually, JSjet and Tern do provide type hints in the Outline View and mark things they regard as "prototypes" with a "P" and specific objects derived from a constructor function (and its prototype) with an "O". (The latter is, of course, also true for object literals.) Elements of classes, constructor functions and prototypes are displayed as sub-elements of a related "P"-section in the Outline View. The type of such variables and functions is revealed - if JSjet can determine it. JSjet does, however, not distinguish between (this. )elements of a constructor function or elements (functions, variables) added explicitly to the prototype of the constructor function. Under a "P" section for a constructor function "F()" you would see everything that would be available in a specific object created by a "new F()" statement. The relation of a specific object with its constructor and prototype is indicated in the Outline View (at least in most cases) by a reference to the name of the basic class or the constructor function used during object creation. if you never changed the type of defined properties (i.e. member variables) by assigning "values" or code elements with different types after object creation in your code. I.e. if the types of member variables defined in the constructor or in parent prototypes would be kept throughout the whole code execution. if you never extended certain objects by new (!) properties and methods. if you only used conventional prototype or class oriented patterns for inheritance. if you never used some specific objects directly as a prototype for Child constructor functions. Meaning: If you followed a strict and conservative coding philosophy, where everything (! ; i.e. all variables and methods used in the code), is based on classes or explicitly defined elements (properties/functions) of constructor functions and/or (their) prototypes. The extension of existing specific objects by explicitly adding new property variables and new functions/methods - i.e. beyond the prototype members and the constructor variables provided at the object's creation. You can always perform such an extension without modifying prototypes/constructors in the inheritance chain up to your specific object. Such properties/functions would, however, only be accessible by and through the particular object. 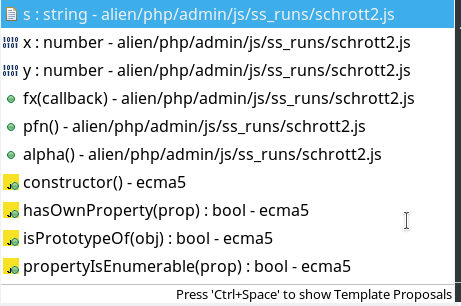 Note that the prototypal pattern is implemented in ES5 via the function Object.create(). As we shall see, JSjet does NOT display an existing specific object, which is used as the prototype of a new constructor function, as a structured "P" element in the Outline View. I guess it was difficult to decide whether one should stress the role of such an object as an existing "object" or as a "prototype" for other objects. Whatever the reason, my JSjet version had no solution to offer for indicating both aspects of an object, which was used both in its role as an object AND as a prototype for other objects. But all properties/functions of such an object would appear below the new constructor function "K()". But I would have hoped that at least the dependency of the new Child constructor function on the specific object was somehow indicated. But this is not the case either - as we shall see. However, as JSjet distinguishes between a constructor function (including its prototype) and objects derived from it, we would expect a proper distinction of variables added to a specific object on one side and the variables of the constructor function/prototype used to build the object on the other side. In addition variables or functions added to an object, which itself is used as a new prototype for further CHILD objects in the prototypal pattern should be associated correctly. Unfortunately, regarding these points I stumbled over - in my opinion - problematic aspects of JSjet/Tern, which I want to discuss below. So, how does it look like - and what does JSjet make of it and what does it reveal in the Outline View? Just click on image or download it in case it is too small to read its content. Or download the following txt file with the code jsjet_test_code - if you want to experiment with it. So... what do we make of the information in the Outline View? Let me walk through some aspects of the information displayed in the Outliner. I have closed some hierarchy parts of the Outline View to get it onto one page; but I shall show the contents of these points where necessary. I start with a positive point: Global variables not explicitly declared via "var" or "let" statements are gathered at the end of the Outline View - in our case starting with the variable "x". Yes, in contrast to JSDT JSjet detects all global variables and displays them! However, one would wish a better distinction of these variables introduced in the code on the fly from explicitly declared variables. Note, that the local variable "z" is missing however. We shall come back to this point. A new member variable "s" of class "Ufo"? 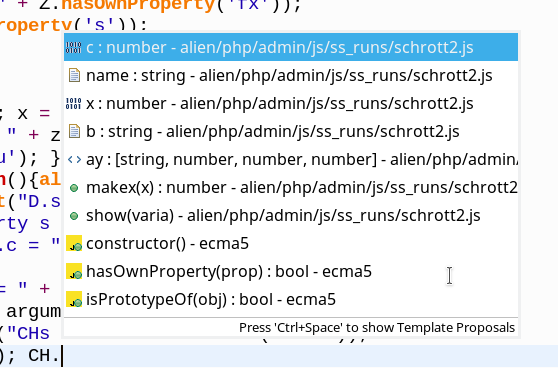 The first line that really looks fishy in the Outline View is the line that displays a property "s" : If we take the information of the Outliner literally we would assume that "s" is an element of our class Ufo (or of the respective internal constructor function and the latter's prototype). However, we never declared any "s" as part of the class Ufo, Ufo's constructor or Ufo's methods! Instead: "s" is added to a specific object "U" based on the constructor of class "Ufo" in the course of our test code (line 24 and 30). 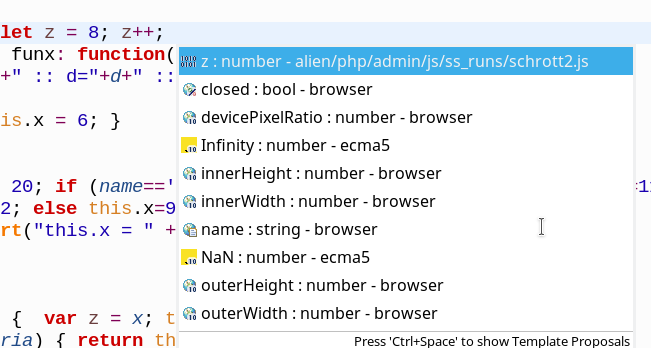 Hmm, who else besides object U in our code example would really know about this property "s"? Who could use it? Have a look at the U-based objects "V" (line 26) and "L" (line 29). We recognize a very simple prototypal inheritance pattern for "L" in line 28/29 and for V via Object.create() in line 26. 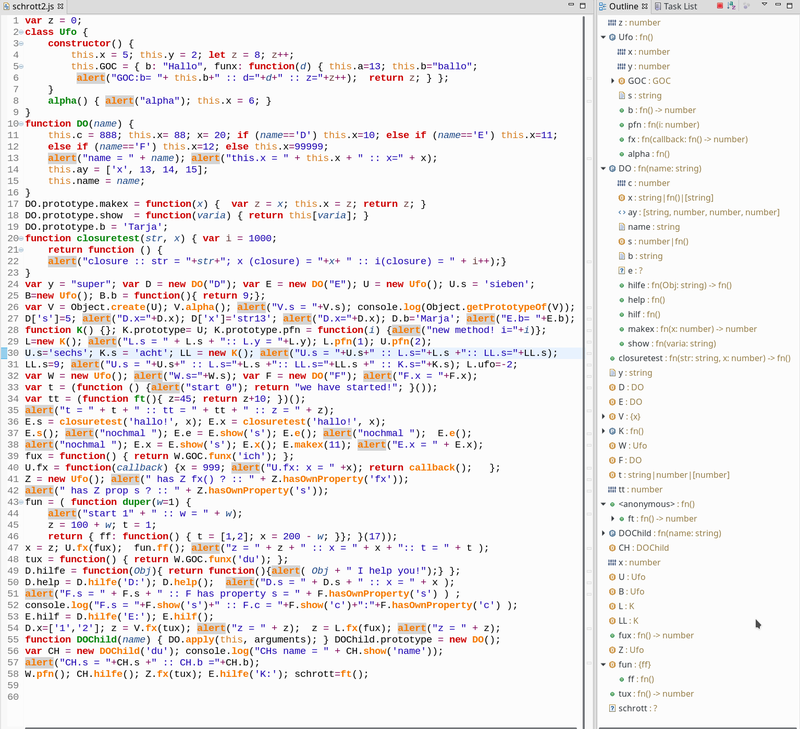 Yes, I mixed the ES6 class syntax with old fashioned prototype manipulations in lines 28/29. Not nice, but valid. What does it mean for the derived new constructor function "K()" - and how is the relation between K() and U represented in the Outline view? 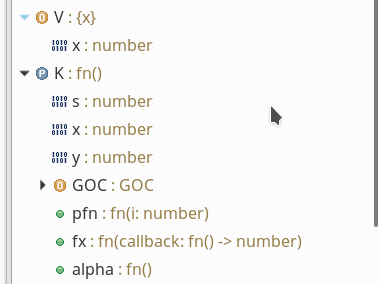 Note, however, that the relation of the new constructor function K() to U is not directly reflected in the Outline View; but this is no real issue. Technical aspects: The prototype of the constructor function K() points to object U. So, actually, object L, which is based on K(), should also know about a property "s" : namely by or the provided through prototype object U. The "Object.create()" function does something similar when creating object "V". Also object "LL" defined in line 30 knows about "s". However, neither the constructor function of class Ufo nor its prototype are really affected by all these manipulations of object "U" and the objects based on "U" ! So, it makes NOT much sense to display "s" as an element of Ufo; it is an element of U, i.e. K's prototype, of V, L, LL. This is very clearly tested by creating an additional object "W" based on Ufo after all the fuss with the extension of U. As expected W does NOT know anything about a property "s". Is this problematic? Well, in our simple example picking up an "undefined" property form the code completion dialog would not matter much. But things would become much more dangerous if the JSjet code completion window offered undefined functions/methods! Guess what: It does! See below. 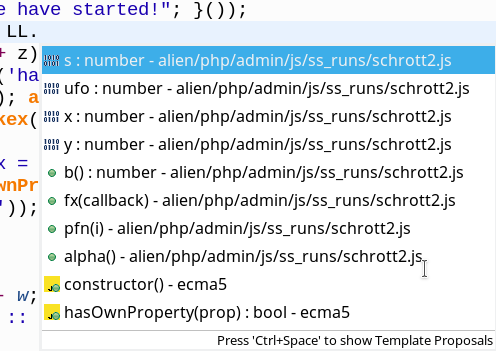 From our example we get the following impression: During code analysis JSjet picks up new properties (and possibly functions,too,) added to specific objects, which themselves were derived from a class constructor. JSjet then associates these properties/functions with the original class constructor; JSjet presents them as if they were elements of the related constructor/prototype and thus at the inheritance origin of all derived objects. This is misleading. Just a strange way to analyze the ES6 "class" syntax? Well, you see this (misleading) pattern again when you look at how the property "ufo", which is added to object L at the end of line 31, is reflected in the Outline information about the constructor function "K()" (see the picture on K above). Undefined method/functions pfn() and fx()? 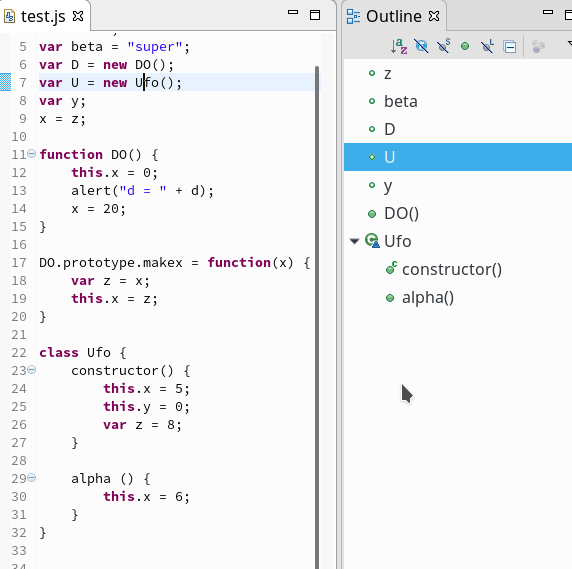 Note that in addition to "s" JSjet displays two methods/functions "pfn()" and "fx()" as elements of our class "Ufo" [better: its constructor/prototype] . But again: We never declared these methods for class "Ufo"! Instead we did something very different: We added function "pfn()" to the prototype of K() (and thus indirectly to object U) (line 28). And much later (after the creation of V and L) we added function "fx()" directly to our object U (see line 40). So, after this point in the code both V, L and LL would know about fx(), too, and could execute it properly. Normally, one would not program in this dangerous way - but it is possible. Picking functions from the JSjet code completion dialog window whilst coding in Eclipse can under certain circumstances lead to code errors! We additionally check that the original class properties are kept and are not modified throughout the code via our object "Z"; see line 42 (result : false) and line 59 (error). Presenting variables and functions, which are added to a specific object, as elements of and within the scope of the object's "class" in the JSjet Outline View is at least misleading. Personally, I would even say that it is wrong! Offering such functions in the code completion dialog as possible elements of newly created objects, which are based on the original class, may lead to errors! Is this a systematic bug or does it somehow depend on the relatively new ES6 class definition syntax? Nope, it goes wrong also for prototype based declarations of objects; see below. Interestingly enough JSjet does NOT see what object V inherits from the prototype delivered to "Object.create()" - in this case the object "U" itself. In the Outline View V is only presented as a literal object - for whatever reasons. Only one variable, "x", is displayed as an element of V. That it appears at all probably results from an analysis of Ufo's function alpha() which is called a bit later via "V.alpha()" ... [This assumption can be tested by modifying alpha().] So JSjet knows about the indirect dependency of "V" on class Ufo - but this knowledge is not used for V's presentation the Outline View. So, here we see a clear limitation of the analysis depth of JSjet/Tern: Private variables are neither shown in the Outline View nor do they appear in a safe and distinguished way in the code completion dialogs. In general: Private variables defined in any kind of function are out of the scope of the Outliner. This is annoying; especially because the code analysis actually does seem to know something about the existence and even the type of "z": the type of the return value of the GOC-method funx(), namely "z", is detected correctly. Let us turn to the constructor function "DO()" (and its prototype): The Outliner tells us that there is a variable "x" having 3 different types. It is claimed that "x" is an object! But we did NOT define any string or array values for the variable "x" of function "DO()" or its prototype. Neither did we declare "x" as a function! Instead "x" was explicitly given a number-value in the DO-function's body! Again, our problem is that JSjet's Outliner does not distinguish sufficiently enough between variables and functions of a specific object and variables/functions of the constructor or prototype, from which the object was derived. In the course of our (chaotic) code we assigned a string to an object "D", which is based on the DO() constructor function, via D['x'] = 'str13' (line 27). In addition, near the end of the test code, we assigned an array to "D.x" via the statement "D.x=['1','2']" (line 54). And in between we assigned a function to the member variable "x" of an object "E" via "E.x=closuretest(..)"; "E" was derived from the constructor function "DO()", too. But what do these object specific changes of properties have to do with the original variable "x" of the constructor function and its type there? Answer: Nothing! So, again JSjet/Tern provides us with somewhat misleading information about the elements of the DO() constructor. In my opinion, the object specific modifications should have been displayed beneath the affected objects and not below the DO() function. The constructor itself will always deliver a "number" for the "x"-variable of any object created by "new DO()". The only piece of information that would make us suspicious in this case is the presentation of "x" as an object (!) in the Outliner. We could interpret this as a warning about how the variable "x" is used later on in specific objects; but even this would be confusing as, unfortunately, the original type of a number is not displayed. As we did for our class "Ufo" we tested the consequences of an extension of objects created by a "new DO()". We added again a variable "s" to some of these objects. Furthermore, we also supplemented functions - directly or indirectly. See the statements "D['s']=5" in line 27, "E.s = closuretest(..);", "E.x = closuretest(..);" in line 36 and E.e = E.show('s') in line 37. As a first consequence we get a variable "s" in the information about the constructor DO() (or its prototype). Which - in my opinion - is misleading and wrong. Again, "s" also and wrongly appears in the code completion dialog. Now let us have a look at the information about "E.e". The type of this member variable is not specified in the Outline View. This is interesting because "E.s" was correctly detected as a function before. "E.s" is a function assigned by a closure, and E.e uses E.s. But the fact that we set "E.e=E.show['s']", which only indirectly points to a the function E.s(), seems to block the type recognition. And after that even the explicit call as a function "E.e();" in the code does not help. But OK -- it is always difficult to follow indirect assignments ... What we must complain about, however, is again the fact that "e()" nevertheless is offered as a legitimate function (!) in the code completion menu for object D (see the picture above). But: E.e() will never be available for object D ! The problematic display of variables and functions, which are added to specific objects, as elements of the "prototype", from which the object was derived, is also found when we use classical constructor functions (and their prototypes) for creating objects. In addition JSjet either does not recognize the relation of an object with a prototype object when Object.create() is used, or JSjet does not indicate this relation in the Outline View. Regarding the global function "closuretest()" we again bemoan the missing display of the private variable "i", which actually makes this function a closure ("i" is manipulated in the returned and encapsulated function's body). Closures are one of the possibilities to provide real private variables in a lot of JS patterns - but JSjet/Tern does not help us here. In the code completion dialog the origin of the offered "i" is not specified either (we are only told that "i" appears in JS file). In this case i's location and meaning would be clear; but what in longer real life codes? The next strange point is the handling of an immediate function statement with a named (!) function inside; see the declaration of "var tt", whose resulting type is recognized correctly. I admit: The naming ("ft") of the encapsulated function does not make much sense, but interestingly the analysis of JSjet seems to run into an infinite loop for displaying the internal structure of the "anonymous" function block - containing the "ft()". See the following picture! Really confusing! And compare this with the unnamed immediate function in the declaration of variable "var t". But it gets even more confusing! In the code that follows after the definition of "ft()" we find a direct counterexample - namely the definition for the variable "fun" in line 43 - which was not declared via a "var"-statement. 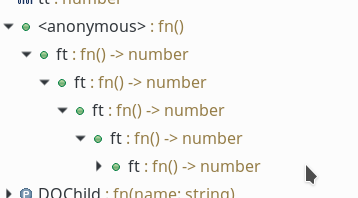 Here we also have used a named function encapsulated in brackets for immediate execution. However, in this case we do NOT get a display of a seemingly infinite hierarchy structure in the Outline View! And something positive In addition: The type of the global variable "fun" is recognized correctly as an object defined by a literal. But the encapsulated immediate function is ignored in the Outline View; function "duper()" does not appear there at all. However: As soon as you replace the assignment statement by "var fun = ", an infinite hierarchy recursion appears for function "duper()" in the Outliner, too! Try it yourself, if you do not believe it! Association of added object properties/functions with Child constructors? At the end of our example code we test a simple kind of a 2 step inheritance pattern. The statement "DOChild.prototype = new DO();" leads to the fact that the internal structure displayed for "DOChild()" is exactly the same (and wrong) one as displayed above for DO itself. 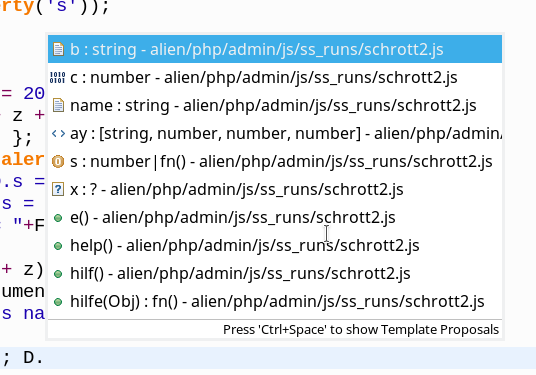 Also there the variable "s" and functions as "hilfe()" etc. appear - which we know is wrong. But now we are a step further down in the prototype chain! So, it is even more misleading to display the elements in question in the Outline View for the Child constructor! Good news! We do not see anything wrong! The information in the code completion dialog about available elements of a child object following a standard inheritance pattern is totally correct! This makes the appearance of the critical functions in the Outline View as elements of the constructor function DOChild() (or its prototype) even more mysterious! What a mess ! A method added to particular object derived from a parent class appears in the list of functions offered by JSjet's code completion as valid members of a Child object created by the constructor of a prototypal chain based on another object. Not good ! Eventually, we may also remark that the results of the code analysis reflected in the Outline View depend a bit on the order of statements. I recommend to play a bit yourself with similar test codes and the order of statements before buying a license. The amount of information given by JSjet/Tern in the Outliner is significantly bigger and contains more structural elements and type hints than the information provided by today's JSDT. However, the depth and quality of the code and object structure analysis is limited - and some information is actually misleading. In my opinion the most critical point is the fact that properties/functions added or supplemented to specific objects are gathered and displayed as if they were elements of the objects' constructor function, its prototype or the objects' basic class (if you used the ES6 class syntax) - i.e. as elements of the elementary constructor/prototype from which the particular objects were derived. 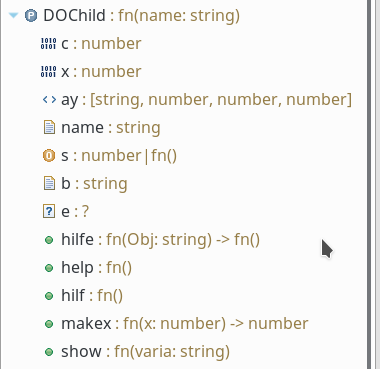 This way of gathering and associating added variables and functions of specific objects can even affect the structural information about CHILD constructor functions defined in simple inheritance pattern: The Outline View displays all variables/functions added incoherently to various specific objects derived from a PARENT Constructor as valid elements of the CHILD constructor function (or its prototype). The wrong association of new and object specific variables/functions with the basic constructor/prototype of these objects is unfortunately also transferred to the code completion support. This, already, may lead to coding mistakes! 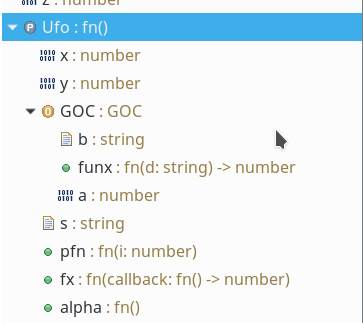 But, even worse: The information about the wrong association is transferred across a prototypal inheritance chain: Functions added only to specific objects, which are different from an object "U" but based on the same constructor as "U", will appear in the code completion dialog for any Child object created with the help of a new constructor K() that used "U" (!) directly as its prototype. I regard this as a really negative aspect of the JSjet/Tern toolset - which may even lead to coding errors! However - and really surprisingly - as long as we follow a standard inheritance pattern for a Child constructor function the code completion dialog does NOT offer any critical undefined variables or functions. In contrast to the information provided in the Outline View! And in contrast to a prototypal approach. What I would have expected of JSjet in any case is to display object specific elements below the respective objects in the Outline View and not below their classes/constructors. In addition: Such specific properties/functions of a particular object should only appear in a derived CHILD constructor function when and if this constructor function uses the particular object explicitly as its (i.e. the function's) prototype. I must say that the findings described above frustrated and depressed me a bit. However, you can still use the information in the JSjet Outline VIEW for navigation purposes. But you should be extremely careful with its interpretation and the use of the code completion! And you should program cautiously and very conservatively! In addition I must say, that JSjet is not for free - at least not for a reasonable amount of development work per month. And ordering a license comes with a - in my opinion - strong negative side aspect - which I do not like at all. It has to do with the automatic and periodic information transfer to the company behind JSjet. This is the topic of a third post. So, no "methods" (i.e. functions of prototype objects) are listed in the Outliner. Tested on a freshly installed Neon 2. See below the very simple test code (really, only for testing; I normally do avoid global variables ... ). Frankly, I think this is a bit of a mess; you may also note that the global variable "x", which is not declared explicitly with a "var" or "let" statement, does not appear at all in the JSDT Outliner. You can't work and navigate with such an Outliner in real world projects, especially when you do some more complex Ajax/Ajaj development ..... Also code changes show up in the JSDT Outliner only when and after a you explicitly save your JS file. 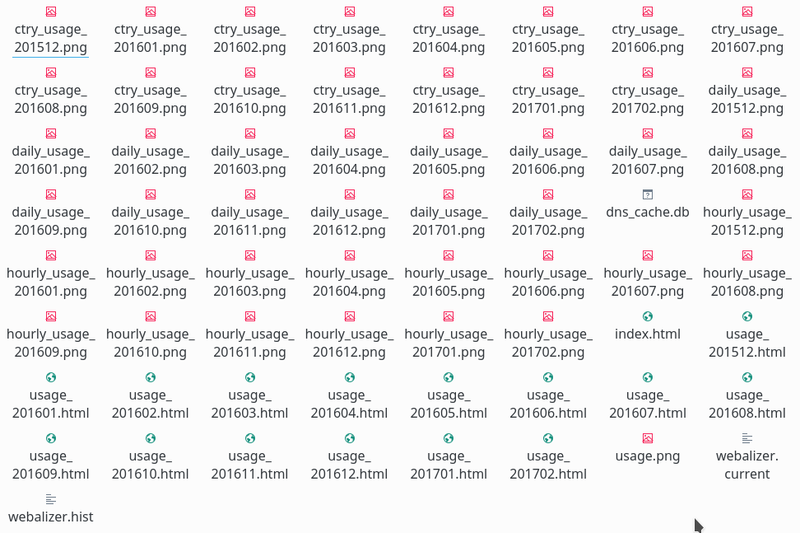 Alternatives for JSDT? 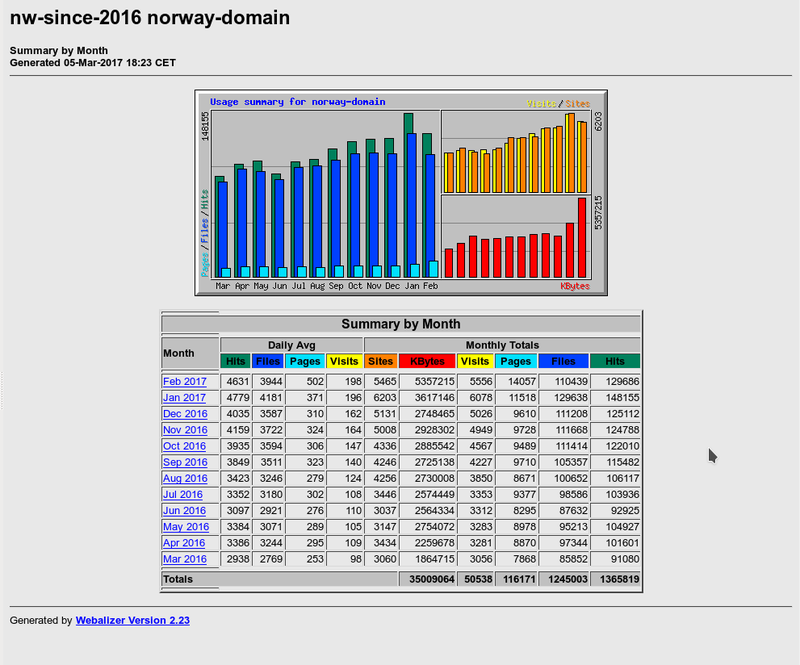 Webclipse JSjet? So, I started to look for alternatives for or supplements to JSDT in Eclipse Neon. One could think about Aptana Studio. However, the Jenkins repository for Aptana 3.4.x on the Eclipse marketplace is presently not working (since midth of Feb 2017 by the way; due to license and legal aspects). 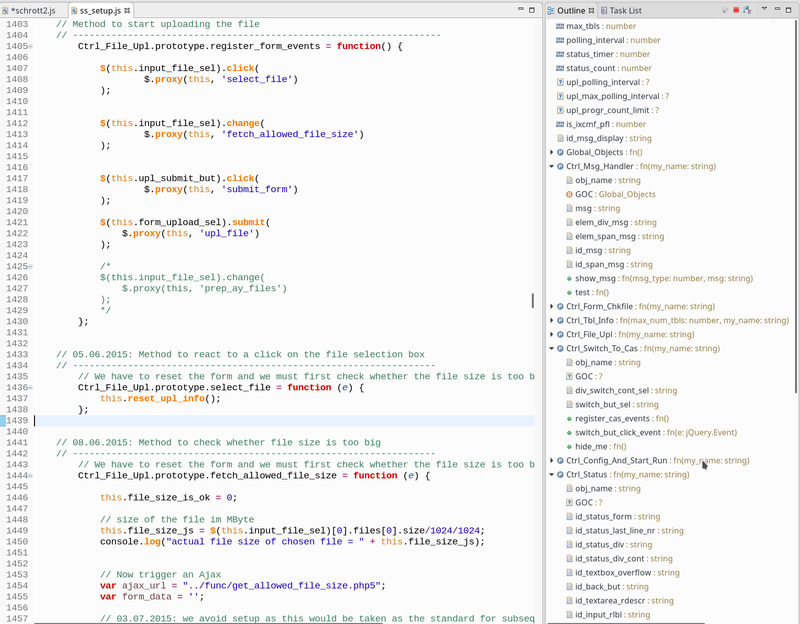 And for the Aptana studio plugin for Eclipse I have always experienced some conflicts with other plugin packages and their editor components in the past. So, I tried some other things as e.g. Vjet, but nothing really convinced me. JSjet and the Eclipse Outliner - What is good? Functions that are used as constructors in a "new" statement or functions with explicit prototype declarations are marked with a "P" for "prototype". This is certainly helpful for a quick orientation. 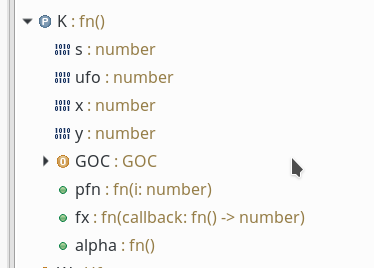 For arrays you get an oversight over the different types of the array's elements. See the test example of my next post for a display of this property of JSjet. By the way: The same depth of information is provided by the "Quick Outliner" which one can activate by pressing "Ctrl O" or via opening a context menu point after a "right mouse click" on a code element. 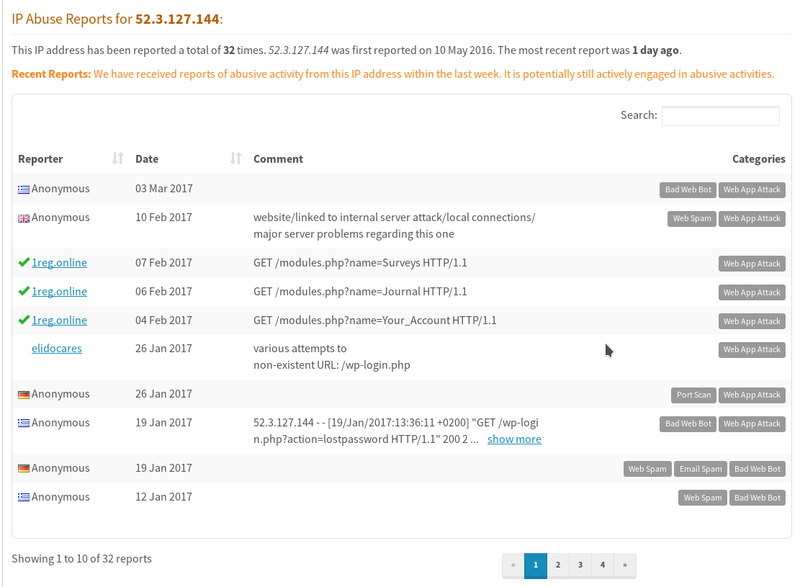 Project wide or local code analysis of the present file via "Tern"
When you install JSjet some more Eclipse plugin modules from the French "Tern" project are installed. Tern itself uses a local "node.js"-installation provided automatically in your home directory under the subdirectory "~/.webclipse". The basic task of Tern is a project wide code analysis. The default for the scope is "Entire project". For this setting you will e.g. notice that that e.g. (global) variables or functions previously defined in some other files of your project are NOT shown in the Outliner. You may get more information about missing points and their location via an additional context feature, namely the "Call Hierarchy". In the beginning I found this type of analysis and display a bit confusing. Meanwhile, I consider it helpful because it forces you to watch your naming of variables, objects, functions, prototypes and to think about the proper use of namespaces or modules. Availability of information on variables, functions, objects, prototypes in the code completion dialog Knowledge which the duo JSjet/Tern has gathered on global variables, functions, constructor functions, elements of prototypes and classes is also made available in the code completion dialog window. This helps a lot when coding - at least theoretically (see, however, the next post!). 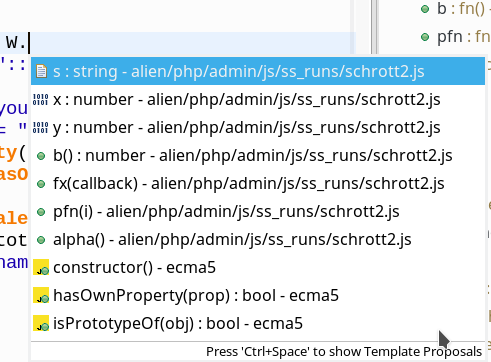 JSjet and the Outliner - what is missing? There are more things which felt not satisfactory when testing JSjet. There are some obvious deficits, which you find very quickly when doing real work with it. As will be discussed in more detail in the next post, no private variables defined either with the old "var" or the new "let" statements inside functions, constructor functions, closures or class methods are shown. This is really a pity! One would like to now what a developer wanted/wants to keep private in a piece of code. Especially, if you work with code not designd by yourself. However, private variables defined inside functions or object methods do appear in the code completion dialog! But using it you may get confused, if there exists a global variable with the same name as a variable declared for the present function scope! The code completion window of JSjet will not make a clear distinction between these two different variables. The variable name will only be referenced once - and the only hint you get is its general occurrence in the code file. We shall see more on this topic in the next blog post. Another missing feature is a collection of shortcut icons at the top of the Outline View for useful operations like a simple full collapse of the code hierarchy structure. Instead the icon area at the top of the JSjet Outline view is extremely reduced in comparison to the standard one for JSDT. You start missing an overall collapse option as soon as you have real life and complicated code structures. JSjet opens the Outline View in a mode where the all hierarchy levels of constructor functions and classes are displayed fully expanded. So you must collapse object for object and hierarchy level for hierarchy level by yourself. In addition there is no option to set on/off a link to the editor actions. JSjet is automatically linked to the editor - which is not always desirable. The worst deficit in my opinion is the lack of filters - in the sense of e.g. "show only objects", "show functions only", "do not show variables", ... . Just to avoid clattering of the Outline view with presently uninteresting things during the development of longer, complex programs. Most of these points were working at last in old versions of JSDT (Kepler, Mars). Yes, I experienced that the outliner did not always give me complete information on objects - even when reducing Tern's scope to the present file. This tends to happen sometimes after having used the "hierarchy call" feature of Eclipse JSDT, sometimes after a long time doing nothing on a project in the same workspace or after having worked on another project in the same workspace. 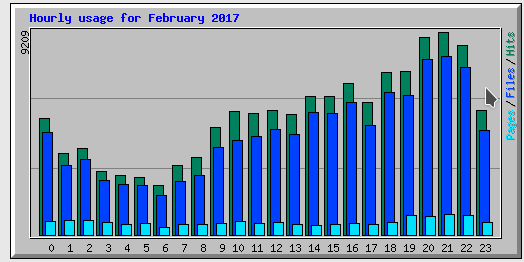 It also happens when you switch the Tern analysis scope. .... or when you work with 2 eclipse windows .... It is unclear to me, what the real cause is - but it happened a few times with Eclipse 2. Maybe computing the Outline contents is not triggered correctly under some circumstances. The behavior became better after a recent update to Neon 3 and setting the Tern settings to quality instead of performance. In most cases closing all ".js" files and opening them again helped. JSjet and Tern overcome the problem of JSDT which provides too few information in the Eclipse Neon Outline view. From JSjet you get sufficient information for keeping an overview over your code and object structure and for navigating between functions, prototypes and derived objects. Is all of the information provided by JSjet in the Outline view really valid?